Seems the era of the Bollywood Masala movies is back. Now a days we see a lot of movies hitting the screen which gives you deja vu feelings and reminds you many blockbusters of 70s, 80s and 90s. Some of them are official remakes, others are a mattress weaved by picking various threads (scenes) from various movies. However if the movie is able to touch the heart string of the viewer, it gets the success it is targeted for, otherwise the chances are high that they are going to be bombed at the box office. One of the recent releases – Kill/Dil – is a typical Bollywood masala movie with the attributes we have just mentioned. 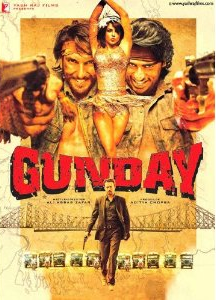 In fact some traces of recently released film Gunday are also visible clearly. There are some scenes you cannot digest as well. For example, how can you believe than an educated and thus (assumed to be an) intelligent girl (played by Parineeti) falls in for a gunda? Some dialogs are really written nicely but the script is the major problem of this otherwise good movie. If the writing could have been better and met with equally fantastic direction then it could have been a masterpiece (in terms of commercial cinema) you didn’t want to miss! But, unfortunately it is not. In terms of performance, Govinda is in top form. He is one of the most under-used actors in terms of his acting abilities. The makers and audience both are equally responsible to cage him in the comic roles. No doubt he have a fantastic comic timing and great dancing abilities, but he can do many other things in better manner too. His role in this film is needed to be written with more attention and could have been meatier than it is. And he is not the only performer to watch for in this movie. Ranveer is equally competent. He need to show two different personas in the film, and he does it successfully. He is equally convincing as the assassin and insurance agent both. Ali Zafar does his bits. Parineeti didn’t get very meaty role but her role of moderate length reminds you of such roles in older masala films (of Bollywood). She exposes more than the movie actually need. Anyway, she does sincere efforts. The chemistry between the main characters is really nice. Be it brotherly bond between Ranveer and Ali or Govinda’s relationship with them, or even Parineeti-Ranveer relationship, they are convincing enough. The screen presence of the actors is highly responsible for them. Cinematography is remarkable at various places. The background music is good and it adds to the mood of the movie positively. Two orphans named Dev and Tutu (played by Ranveer and Ali respectively) are raised by Bhaiyaji (Govinda), a don. They thus are brought up with the company of guns we can say. They work as shooters for Bhaiyaji when grown up! They are happy-go-lucky guys and even tries to irk humor when killing their targets! Eventually Dev (and Ali) meets Disha and falls for her. Later Dev decides to leave the wrongdoing and walk on the past of honesty and earn living by doing a regular job. However they cannot tell this to Bhaiyaji who is like the father to him. So Tutu hatch a plan for Dev. He asked Dev to behave normally with Bhaiyaji and keep getting assignments, Tutu alone will kill the targets and Bhaiyaji will be in impression that everything is going smoothly. But will be? What will happen when Bhaiyaji know the fact? Is the way to the crime world is “one way” as we have been told many times? Can one come back from it? Will Tutu and Dev have to pay sacrifices for the same? Will Disha keep loving Dev after knowing his ultimate truth? So many questions right? They are answered in comparatively dull post-interval portion. Overall a film you can go watch for Govinda and Ranveer’s performances. If you have spare time you want to pass, there is nothing wrong in watching it once.